One of Porter County’s oldest residences, the E.L. Furness Mansion on U.S. 20 in Furnessville, is undergoing a makeover and is set to open as a vacation rental in July. Killian describes the new inn as an upscale vacation rental that’s still affordable for families. The five rooms [and suites have private baths, all but one room with kitchenettes], and some with sitting rooms and fireplaces. “Most importantly, the location is perfect to enjoy the beach and the National Lakeshore with hiking, biking, and horseback riding, and the countless all-season activities in Porter County and nearby Lake and LaPorte Counties,” Killian said in a statement. 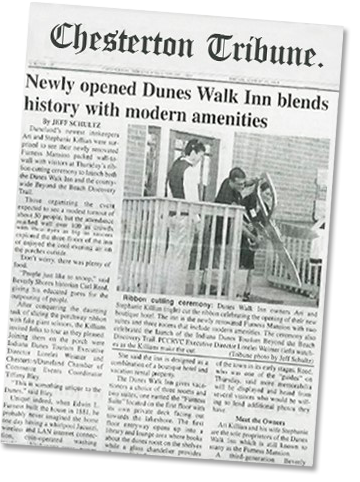 Killian’s company has building experience in the Chicago Metro area, but DunesWalk Inn is his company’s first major project in the dunes. Consortian is a commercial and residential developer, which has won recognition from the Chicago Commission on Landmarks. The inn is about three miles away from Killian’s family house in Beverly Shores. His family history goes back nearly 60 years in the dunes. Killian, who is on site most days as the construction winds down, said the neighbors have been very supportive of the project. “I also credit Jim Ruge at the First State Bank of Porter for his belief in my vision for this property. The Dunes has much to offer visitors and residents alike, and Jim is a great advocate for sustainable development in the area,” he said.